The chief executive and directors of The Hills Group recognise that they have a moral and legal duty of care towards protecting the Health and Safety of the company’s employees and others who may be affected by the Group’s activities. bring this policy statement to the attention of all employees and others (as required) and to seek their co-operation in supporting The Hills Group Board in its objective of achieving and maintaining a healthy and accident free work place. This policy statement, together with associated responsibilities and arrangements will be the subject of continuous review in order to reflect business activities. In addition the undersigned will carry out, or have carried out, a formal review of this policy statement and its associated procedures on an annual basis. 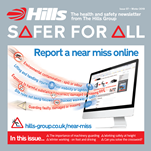 Click here to download the Hills Group health and safety statement.